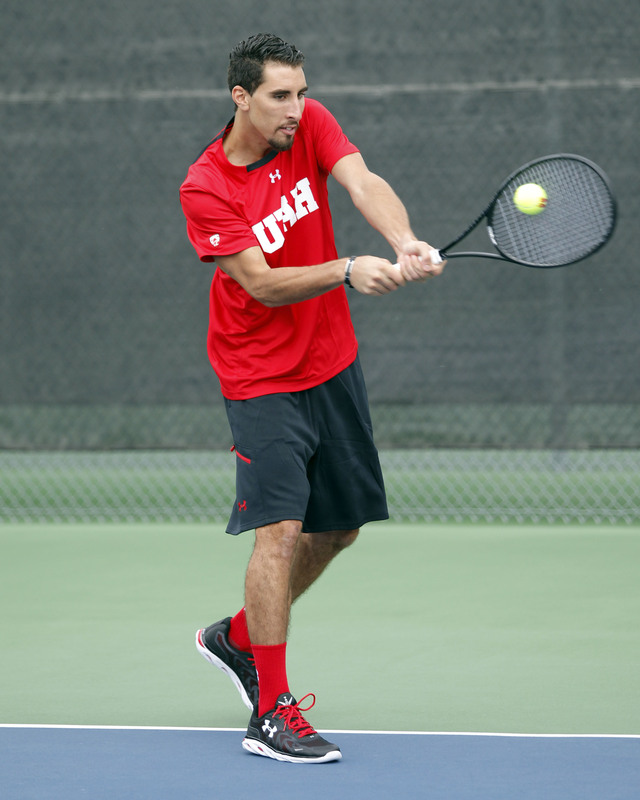 SALT LAKE CITY – The 56th-ranked University of Utah men’s tennis team closed out their undefeated home-opening weekend with a 5-2 victory over Montana Sunday at the Eccles Tennis Center. Senior Slim Hamza netted the match-clinching point at the No. 1 singles position. Freshmen Santiago Sierra and Johan Jonhagen began the match with a win for the Utes in doubles play over Grizzlies Victor Casadevall and Tom Witteveen, 6-1, at the third doubles slot. Montana’s Tomasz Soltyka and Peter Mimnagh-Flemmi answered at the No. 1 spot, topping senior Cedric Willems and junior Matt Cowley , 6-2. Senior Slim Hamza and sophomore Parker McGuiness were able to defeat Semion Branzburg and Alex Braun at the No. 2 position, 7-5, to capture the doubles point for the Utes. Willems quickly put the Utes up 2-0 in singles play when he topped Mimnagh-Flemmi, 6-3, 6-2 at the No. 2 slot. A 6-2, 6-1 victory from Cowley at the No. 3 spot over Branzburg, followed by Hamza’s 6-2, 6-3 win at the top slot over Soltyka decided the match in favor for Utah at 4-0. McGuiness then defeated Casadeval at the fourth position, 6-4, 6-3, making the score 5-0. The final score of 5-2 came when the Grizzlies netted their two points at the Nos. 4 and 5 spots. The Utes return to action Saturday, Feb. 14 in their second double-header of the season at Eccles Tennis Center when they host Northern Colorado and Denver. This entry was posted in Schedule/Results and tagged Cedric Willems, Johan Jonhagen, Matt Cowley, Montana, Parker McGuiness, Roeland Brateanu, Santiago Sierra, Slim Hamza, Utah Utes. Bookmark the permalink.